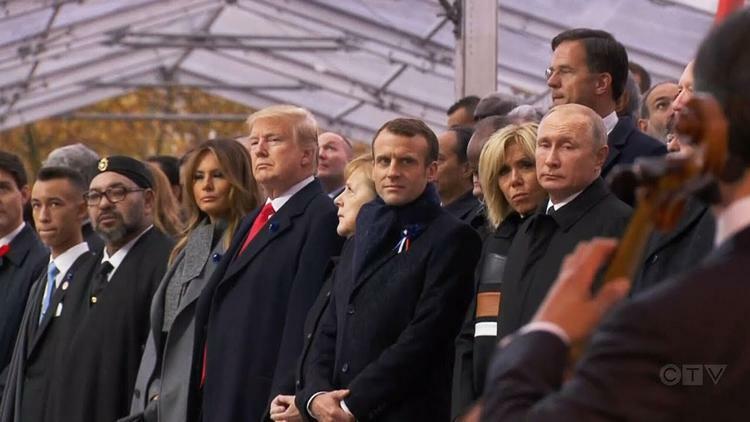 Ann Arbor (Informed Comment) – Emmanuel Macron’s extraordinary rebuke of Donald Trump from the podium at the commemoration of the end of World War I was more than mere rhetoric. Macron, an educated man, knows that modern social science distinguishes between patriotism, which is considered healthy, and nationalism, which has a pathological dimension. As Trump admits, he is a nationalist. In general, one cluster of attitudes has tended to reveal a positive but critical appreciation of one’s country (patriotism), whereas a separate cluster of attitudes has tended to reveal a ‘my country right or wrong’ orientation that has also involved some derogation of other nations (nationalism; Feshbach & Sakano, 1997; Karasawa, 2002; Kosterman & Feschbach, 1989; Schatz & Staub, 1997; Schatz, Staub, & Lavine, 1999). Although there has been some debate concerning definitions, for the purposes of this paper we view patriotism and nationalism as related but distinct attitudinal constructs (Kosterman & Feschbach, 1989; Schatz et al., 1999). In line with Kosterman and Feschbach (1989), we define patriotism as a positive attitude towards one’s nation group without negative feelings towards outgroups (see also Calitri, 2005). In contrast, nationalism is defined as an attitudinal construct that views one’s nation group as superior to outgroups and also contains hate or contempt for outgroups (Kosterman & Feschbach, 1989; Schatz et al., 1999). Patriotism according to the social scientists is a positive but critical estimation of your country, without that implying that other nationalities are inferior. A true patriot might say, “The United States is a remarkably generous country, but it has a blind spot about military interventions abroad.” This sentence contains everything– appreciation and yet criticism. In polling, people with a patriotic attitude decline to be really critical of other countries. Blind support for your nation and intolerance of criticism of it more often than not track with negative attitudes toward internatonalism and toward other countries. As you can tell, Trump is a nationalist by these definitions. His intolerance of criticsm of the US tracks with taking pleasure in criticizing others. Hence Mexicans, he alleged, are rapists. I’m sure he has a list of the the stereotypical faults of each nationality. Viki and Calamitri find also that there is a connection between being nationalistic and actually seeing people from other countries as less human. Social scientists have found that people naturally distinguish between emotions that all human beings, and some animals, have (anger, fear, surprise) and emotions that only their in-group of humans have, such as guilt, shame and hope. And, a lot of people find it easy to believe that their neighbors across the border experience anger, fear and surprise, but difficult to believe that they can really experience guilt, shame and hope. They group other nations with animals in having a less rich emotional life or lacking some higher-order emotions such as guilt. Nationalists in the polling are found to do exactly this– deny human emotions to members of other nations or ethnicities. It seems to me self-evident that if nationalists don’t see other nations or ethnicities as capable of basic human emotions, they are more likely to treat them like animals. The World Wars between them killed tens of millions of people, many of them dying because of the contempt toward them of other nations. Animalizing people, dehumanizing them, is part and parcel of destructive nationalisms that have blighted so many lives so fruitlessly. Trump stands for that dehumanization of others, and his stream of bigoted tweets has made it clear. But I hadn’t at that time yet seen the damage that could be done by a real bully-in-chief in the White House. Macron has seen the danger, and called it out. It remains to be seen whether his own country can long fend off the rising tide of wounded nationalism that threatens our whole world.